This trip definitely deserves a blog post, no matter how lazy I am. Prasanna and Pavan decided for me that I should be going to Rameswaram for the eclipse. 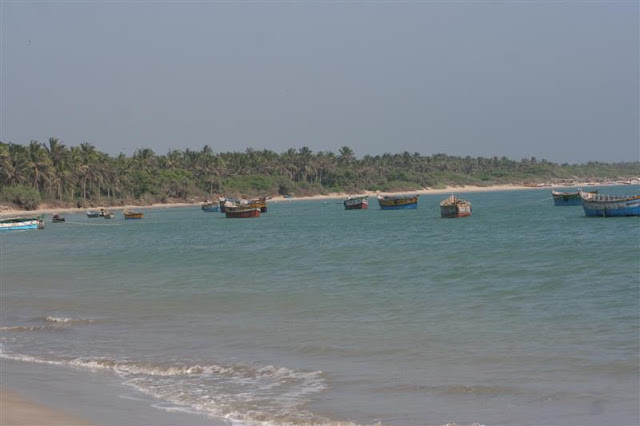 Accordingly, we decided to make arrangements to reach Rameswaram and stay there. In the process we ended up doing the ticket-booking and accommodation reservations for 40 people from IITM! (Eventually, only 25+ of them turned up). The interesting bit of the story starts from the weekend before the eclipse, when Prasanna and Vinay Hegde went to Rameswaram to inspect local arrangements and fix various loopholes in the plan. That’s when we had a terrible shock — locals told us that Rameswaram was going to be extremely crowded on 15th January because of ‘tai amAvAsyA’ (the new moon day in the Tamizh month of ‘tai’) (this did not happen in reality, because the temple was closed for the eclipse — we did have this factor in mind, but didn’t want to take a risk anyway). So we immediately worked towards shifting location to Ramanathapuram. My dad’s friend Sri Shivamurthi was extremely helpful in linking us with the people at Aruna Stores, Ramanathapuram — probably the oldest and most famous bookstore in Ramanathapuram. The people at Aruna Stores were extremely hospitable and helpful (I hear so…) to Prasanna and Vinay who located, with their support, a lodge in Ramanathapuram. Before that, Prasanna and Vinay had already found us an awesome observation site — The Swamy Vivekanda Memorial Hall near Pamban. I was communicating with Prasanna and Vinay over the phone during this, and one thing they told me all the time was that “Local people here are very helpful and hospitable”. Mr. Radhakrishnan and others at the Vivekanandar Manimandapam (as it is called locally) welcomed the idea of 40 students (brats?) coming down to view the eclipse at their location with open arms. Having settled all local issues was a big relief. We had accommodation at Ramanthapuram at “Jothi Lodge”, and a place to observe the eclipse from. Calculatedly, we had 10 minutes 8 seconds of eclipse at our observing point. The next issues to fix were here at IITM. Smruthi, Akshay Subramaniam and Vinay got us a gate pass for the telescopes and what we’d like to call the “Non-Terrorist Letter” (a letter certifying that we were carrying telescopes — and not bazookas! :P). Prof. Sriram was very helpful here. What remained was the projection setup, to project the solar eclipse. Folks on the CloudyNights forums pointed us here http://web.mac.com/picinapod/Sun_Gun/SUN_GUN.html — and we found that very interesting. We used a dustbin, and a pipe fitted to the dustbin using “M-Seal” to make the projection setup. A sheet of A3-size tracing paper stuck onto the top of the dustbin became the projection screen. Incidentally, to make a hole at the back of the dustbin (to fit the pipe in), we did use the help of the Sun, through IITM’s 8″ telescope :D. Naveen Sharma, Prasanna, Vinay, Akshay, Smruthi, and a few others helped us with the projector. This was done and tested in the last minute — probably an hour before we left for the Railway Station. We could not resolve the telescope motor issue though (IITM’s telescope’s RA motor has developed some issues with the feedback loop). Soon, there came a call taxi in which the telescope was put in. All participants assembled at the IITM main gate. There were 50 sun goggles with Prasanna for everyone. I got ready with camera and laptop. We all went to Egmore Station and met up there. It was amazing that we carried two telescopes in a jiffy to the platform, thanks to the large number of friends who were extremely helpful in sharing responsibility of the telescopes. Within minutes, we alloted parts of the telescope to various compartments and people took responsibility to load the telescope quickly into the train. After I was on the train and everything was checked, I began to relax :). All my friends were up on the train. All telescope components were up on the train. We did a quick check and chatted a bit, planned the next morning’s act (we needed to get the telescope down in a 2 minute stop at Ramanathapuram!) and went to bed. Next morning, everyone got the telescope (and themselves) off the train safely in no time! Well, Prasanna and I were somewhat worried about this — but things went off fine. Initially, when we got down at Ramanathapuram, skies were cloudy — but that was natural to expect of the early morning. Courtesy Prasanna and Vinay, two buses were waiting at the Railway Station to pick us up. We got off at Jothi Lodge, which was “adjustable”, as Madhav Vishnubhatta (who had gotten there earlier) remarked. By 9 AM, we were ready to take off. Prasanna ensured I didn’t do crazy things like climb on top of the bus :P. Skies were still cloudy, but there were patchy clearings and instances of sunshine. We had a hearty breakfast of two Utthapams with excellent “accompaniments” (Chutneys, Sambar etc) at Hotel Rajarajeswari on the outskirts of Ramnad. After breakfast, we headed towards Rameswaram. The trip was quite some fun. Skies were clearing slowly. A few kilometres before Pamban bridge, we were intercepted by the Tamil Nadu Governor’s security and asked to stop. We were prepared to setup the telescope right there and observe the eclipse, but they gave us clearing in less than 15 minutes, and we went ahead to cross the Pamban bridge. The view from the Pamban bridge is indeed breathtaking. Sadly, I don’t have good photos of the same. I’m sure someone from the group will. Mr. Vijay Kumar from TANASTRO was showing me some really good pics from the Pamban bridge. In any case, let me continue. After crossing Pamban bridge, we picked up Rajashekar who was joining us from Bangalore and headed to the Vivekanandar Manimandapam. Just as Prasanna had described, the place was really beautiful. The beach was extremely clean, with deep blue water. The Manimandapam had a statue of Swami Vivekananda and one of the king of Ramanathapuram bowing in respect. There was also a very nice meditation hall. Overall, the place was brilliant. I wish I lived there! The people there — Mr. Radhakrishnan and the friendly pATTi who took care of cooking for the Manimandapam’s employees were extremely helpful! At some point after the eclipse, I surveyed the meditation hall — and as I closed my eyes, I didn’t feel like getting up! I really would recommend this as a must-visit spot for anyone going to Rameswaram. The Manimandapam was built in memory of Swami Vivekananda’s return from the Chicago Parliament of World Religions. After he returned, it is said that he first set foot on Indian soil near Kunthukal, which is where the Memorial is built. The rAjA (king) of Ramanathapuram, who funded his visit to Chicago, hence takes a place in the memorial hall. When we pulled in at the location, the partial phase had just begun. People from Bangalore / BAS were already there, photographing the eclipse and trying to do some quantitative measurements / experiments. We distributed solar goggles to everyone and everyone enjoyed the view of the small cut across the sun. There was a lot of excitement in the air already. I was prancing around in excitement until Prasanna dragged me back to set up the telescope. We set up the two telescopes with the everyone’s help in a very short time. Soon, people were looking at projected images of the sun on Akshay’s 6″ telescope. Photo Credit: Siddeshwar B Patri. Photo Credit: Adarsh V E.
Eventually, we rediscovered pinhole projection. So we had the eclipse projected from pinholes made in people’s hands, and by a nearby tree, which happened to be the only one in the vicinity of our telescopes. Using Akshay’s hands to project the eclipse. We had a lot of passers-by and visitors to the Manimandapam who showed some interest in the eclipse. And soon, it was time for the second contact. I was trying to photograph it at prime focus with IITM’s 8″ f/5 telescope, but I could not achieve sharp focus — so I lost out on Bailey’s Beads during the second contact — I didn’t even see them. But people who observed them on the projection got to see them. We had “warned” everyone in advance to not miss out on those Bailey’s Beads, so everyone was well prepared to view and photograph the fleeting spectacle that was going to last for 2 ~ 3 seconds. The spectacle of Bailey’s Beads was enjoyed by everyone at the 2nd contact (except for a few like me). The next celestial display was the Ring of Fire, the almost “perfect” annulus in the sky that we were going to witness. The ring of fire looked really divine through the solar goggles. One could see a beautiful annulus in place of the sun! We also saw beautiful circles beneath the tree during annularity. As the annularity was about to end, we prepared for Bailey’s Beads again during 3rd contact. This time, I went to the projection setup to witness the phenomenon with my eyes! The sight was really beautiful! The beads lasted for about 2 seconds and we were back into the partial phase! Adarsh made a video of the annularity, and that is yet to be uploaded. Watch the comments section for a link. After a very satisfying annularity, we took a few shots of the partial phase, and headed towards the beach! In the meanwhile, folks who had joined us from BAS left. Nobody can resist a clean beach! Having witnessed Orion Nebula and a few other celestial sights through the telescope, it was time for the culmination of the Large Magellanic Cloud (LMC). Given that we were at 9 degrees North latitude, we thought we should give it a try. We had only the sea in the south — no lights for several kilometres! But then, there were passing clouds and sea fog. 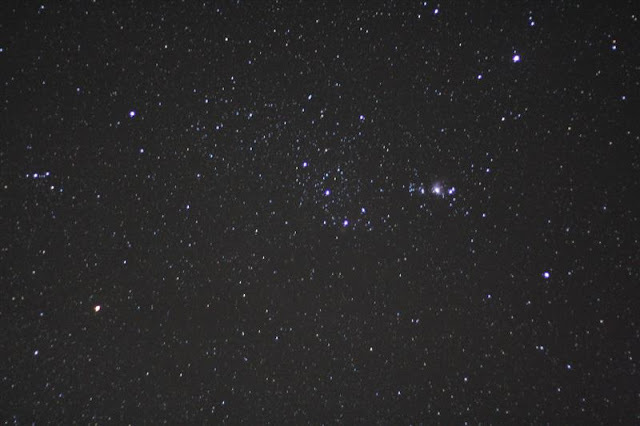 However, I was able to locate a few stars of the constellation Reticulum with the help of KStars, from where I was able to connect up to get to Epsilon Doradi, the reference star for LMC. 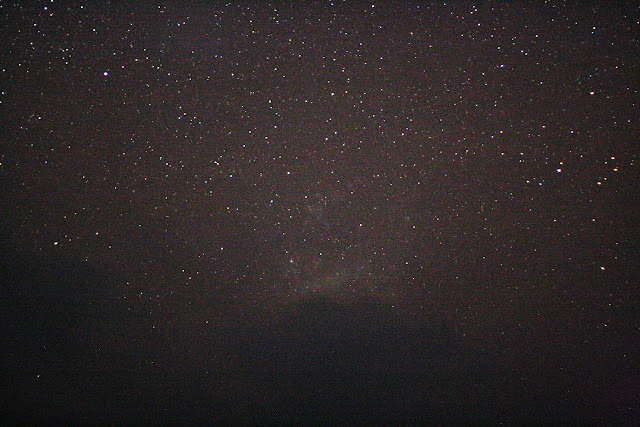 The skies in the region cleared for quite a while, and with averted vision, one could see a HUGE, but faint patch of light there. Akshay confirmed, and so did Smruthi. In a while, we had found the brightest part and fixed its orientation and elongation. We later confirmed this against Prasanna’s photograph. 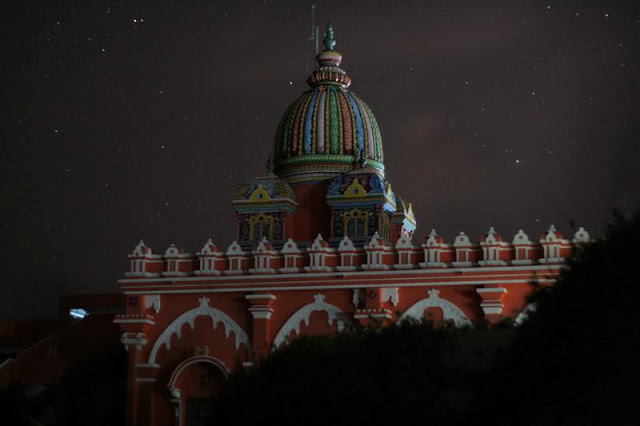 By then, folks who had gone to Ramnad had come back, and after hiding secretly from them (in the dark) for long, we revealed our locations and showed everyone the LMC. More than 15 people were able to see the LMC with the naked eye! After that, we all headed back to Ramnad. 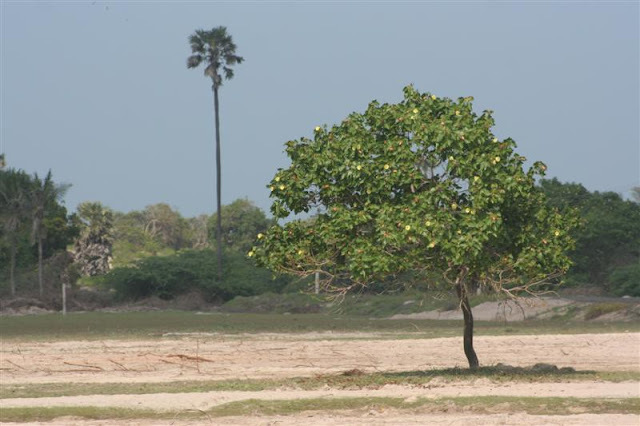 At Ramnad, we split into groups and headed for sight-seeing. 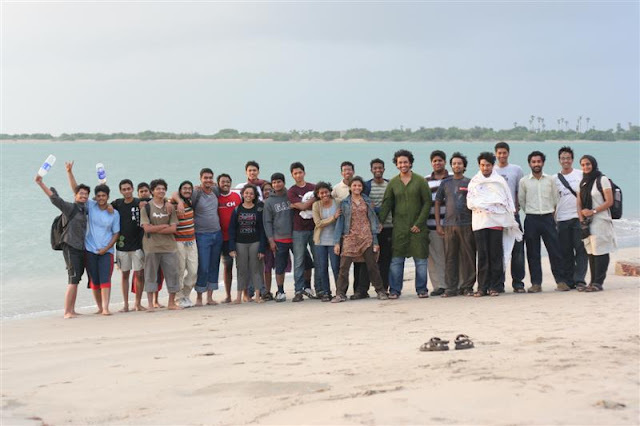 Majority of the folks went to Rameswaram, while Prasanna, Sathish and Smruthi attempted a visit the confluence point at 10,79. Shafeeq and I stayed back to finish some local work, and then headed to Rameswaram. 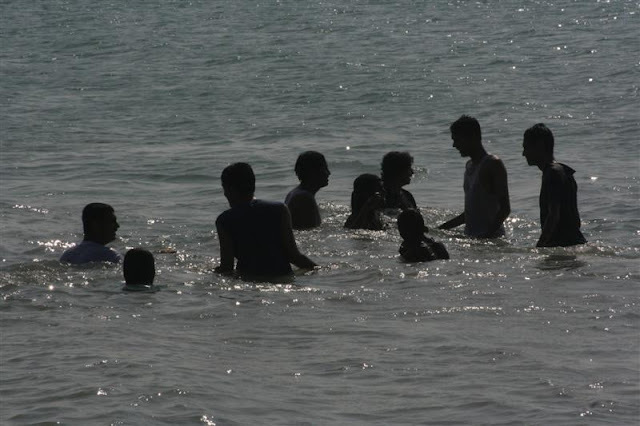 At Rameswaram, we met up with the rest of the group at Hotel Ariyas, where they were waiting for lunch. Lunch at Hotel Ariyas was excellent — particularly the Vatha Kuzhambu. We all helped ourselves to multiple servings. For the Rs. 40/- we paid, the unlimited meal in the A/C hall was definitely worth it! After lunch, we were debating on where to go. We again split into two groups — a large group left for Dhanushkodi, and the remaining 6 of us left for the Ramanathar temple. (When I entered, I did not know whether it was a Rama temple or a Shiva temple!) The main siva linga is said to have been consecrated by Lord Rama, who prayed to Siva when he wanted to cross the Ocean to reach Sri Lanka. We got a brief glimpse of the linga. Goddess Parvathi in the ambAL sannadhi looked really beautiful amidst the lamps illuminating her and all the floral decoration. Adarsh’s cousin Balaji was our tour guide through the temple, and he helped us a lot there. On our way back, we again had overpriced, but nevertheless good tea (served in unhygienic tumblers :P) at a tea stall in Rameswaram bus stand, and then boarded a bus to Ramnad. At Ramnad, we checked our reservation status at the railway station, and then went to the neighbouring Hotel Amritha Balaji. At Hotel Amritha Balaji, I had one of the best Ghee Roast Dosas I’ve ever eaten. We were struggling to finish our second Ghee Roast dosas! They were really full of ghee and very very tasty, along with the awesome chutneys. We then left to our accommodation at Jothi Lodge and got ready to leave for the railway station. A quick talk with the bus driver, and we had a bus for 21 of us. Everyone + Telescope got onto the train in the 2-minute stop very comfortably. Prasanna, Smruthi and Sathish boarded the train at Trichy. 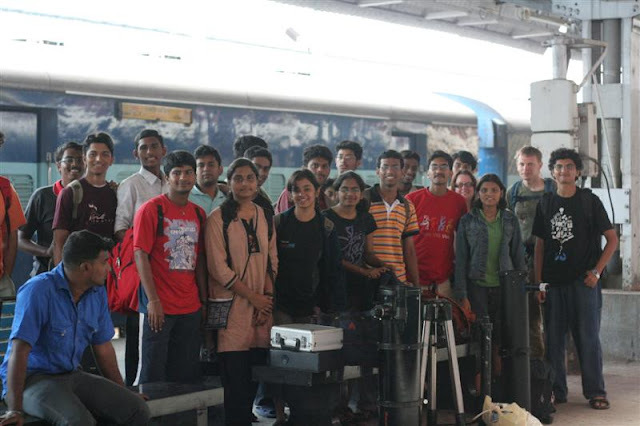 We took some group snaps after arriving at Egmore, and parted ways (home / IITM by different routes). Overall, this was one of the best trips I’ve been on! 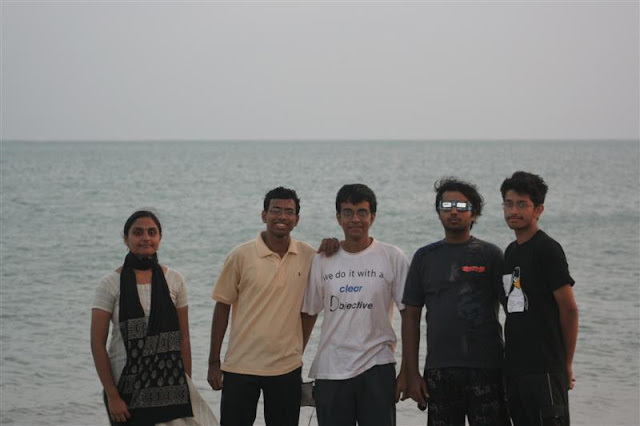 Interestingly, I never met Shashank and Pavan (friends from Bangalore who were at Rameswaram too!) throughout the trip! We met Mr. Vijay Kumar, Mr. Parthasarathy, Balaji and others from TANASTRO on the train back, though. Good writeup and equally good pictures. You have not just captured the eclipse but the spirit and mood of the moment too. Nice, really. Nice trip blog. Managing such a huge crowd is not easy and you guys have done it. you have got beautiful pictures as well. It is unfortunate that we missed you guys as whole of ABAA was there at Rameshwaram. Hope you have checked out our pics. Below find the links of my pics taken at Dhanuskodi. hai mr.prasanna, Good writeup and equally good pictures. You have not just captured the eclipse but the spirit and mood of the moment too. Nice, really.